Please stop by the Welcome Table at Coffee Hour! If you have not already pledged your Stewardship support (Treasures, Time and Talents), please do so and join our St. George Family by filling out the Stewardship Packet in the Narthex. Someone will be there to hand them out after Liturgy. Thank you! Are you musical? Like to sing? Sing along with the choir during service? Join our choir!!! Attention PK-6th grade students: Join us for a Saturday of Lazarus Retreat on April 20th in the Cultural Center. After PTO breakfast, and in conjunction with the Palm Cross making, there will be various learning and craft opportunities for all! For example: How to make a palm cross, the symbolism of the red egg, make a Pysanky (Ukrainian) Egg, make a 'Right Values' necklace (Philippians 4:8), learn about the Resurrection through making Resurrection cookies. Speakers, music, food and community! Need Pascha gifts? Let us be your quick pick this Palm Sunday. While visiting the bookstore, take a look at your lending library with selections for all ages! 2019 Stewardship forms are available at the church office or in the narthex. The Stewardship Committee is waiting to assist you! Be a part of the St. George Family!!! Thank you to all our faithful Stewards for their support of our St. George Stewardship Program! If not you – who? If not now – when? Time + Talent + Treasure = Stewardship! PLEASE NOTE: Recurring Stewardship payments for 2018 do not automatically renew for 2019. Please set up your payments for 2019. ENJOY THE CONVENIENCE OF ELECTRONIC GIVING!!! Did you know that St. George Church offers you the convenience of electronic giving? You can now make all donations to your parish life online! Pledge & donate your Stewardship for 2019 online! Give your weekly candle and tray offerings, Easter offerings, Epitaphios offerings, as well as donations towards the Epitaphio flowers, coffee hour, cemetery grave purchases and more! You can pledge & donate online to our Iconography Project. Be a part of our Community Icon, or donate an icon of your own. You can make a one-time payment, or schedule weekly/monthly/quarterly payments automatically! For additional information contact the church office or log onto www.stgeorgeap.org/vanco and start today! 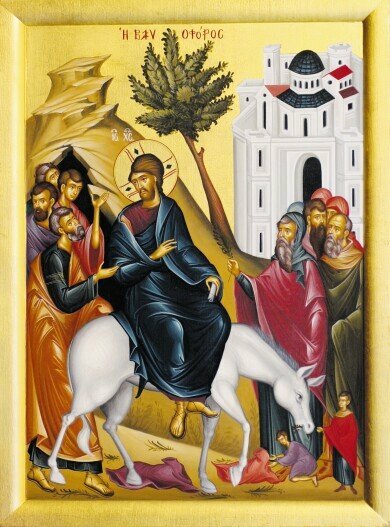 On March 16, the Iconography Committee met with Iconographer George Gariskanis to finalize the planned Phase 2 Icons. On the St. George website www.stgeorgeap.org/iconography is a poster that lists with highlights in red of the available icons including Prophets, Pendentives, Solea Arch, Crucifixion, Hierarchs, Diokonikon, Deacons, Saints behind the Chanter Stand, Scenes of the Life of St. George under the Choir Loft, and Saints to the right and left of the Choir Loft. Now is the time to pledge especially if you have a particular Saint in mind to allow the Iconographers to prepare the canvases for the Fall 2019 installation. No donation is too small; please consider a donation to the Gold Leaf Program or Community Icon. If you have already pledged, please make a progress payment toward your pledge as we will be incurring additional expenses. Please contact Father Andrew Eugenis; Anne Papageorge, Iconography Chair; or John Michals, Iconography Fundraising Sub-Committee Chair to discuss your options. Thank you for your support and generosity as we move toward our ultimate goal of Consecration in the fall of 2020. Information for contact: Father Andrew, frandrew@stgeorgeap.org, Anne Papageorge, John Michals jmichals@desotc.com or the Church office 732-775-2777. Other information is available on our website www.stgeorgeap.org/iconography and pledges/donations can be made on-line at www.stgeorgeap.org/vanco. Faithful Hands ministry is making baby blankets for a local group to send all throughout the world to families with babies recovering from airway surgery. These tiny babies need our extra hugs and prayers! If you have any leftover baby yarn you can donate to our project, please drop it into our YARN DONATION box near our Mustard Seed bookstore. Any color yarn would be a blessing! Please visit copingwithlm.org for more information on this caring group. Of course EVERYONE is welcome to join our Faithful Hands group - see our notice below for dates and times! "Heavenly father physician of our souls and bodies, you have sent Your only-begotten Son and Our Lord Jesus Christ to heal every sickness and infirmity, we ask that you visit and heal also your servants Heather, Pat, Kaitlyn, Judy, Nicole, Jim, Stacey, Steve, Caroline, New Zealand Families, Martin, Sophie, Anastasia, Konnie, John, Rafael, Marty, Rita, Elly, George, Helen, Angela, Megan, Andrew, Penny, George, Sabrina, Spiro, George, Stathis, Demitri, Sava, Jean, Patricia, Domna, Gary, Irene, Cam, Fermo, Patrick, Spiro, Ian, Erin, Nick, Renae, Gabe, Tara, Maria, Anastasia, Greek Familes from Mati in Athens and our Security Forces from all physical and spiritual ailments through the grace of Your Christ. Grant them patience through this hardship, strength of body and spirit and recovery of health. Lord, You have taught us through Your word to pray for each other that we may be healed. We pray that You heal Your Servents and grant them the gift of complete joy in You. For You are the source of healing and to You we give glory in the name of the Father, Son and Holy Spirit. Amen! Remember to register St. George Greek Orthodox Church for all your Amazon purchases. Our Church receives .5% for every purchase. Simply paste the link below in your browser, to be directed to the registration page Amazonsmile: https://smile.amazon.com/ch/21-0643361. Follow us on social media: Facebook, Twitter & LinkedIn. Watch our live services each Sunday. WOULD YOU LIKE TO SERVE ST. GEORGE? Get trained for Narthex Service: open/close the doors, extinguish candles & clean Icons, 7-Day Candle Placement; rotating schedule for service. Can you help? Please contact the Church Office at 732-775-2777. Friendly reminder: When making a contribution, please ensure all checks include the specific “fund” where your contribution should be applied. THANK YOU!! Please be considerate and make room in the pews for others. If you insist on keeping the end of the pew, please be aware of others looking for a seat and step out to allow them to enter. Those in the stasidia must step down onto the floor as follows: *When the Gospel is being read, *During the Small and Great entrances, *During Holy Communion. It is disrespectful to stand higher than the Holy Gifts. Please instruct your children in this discipline as well. All doors and lights must be secured before leaving facility. The Township of Ocean has advised that fire lanes must be kept clear. Lost keys or fobs will require a fifty dollar fee to replace. Please do not adjust the thermostats.